Orbital Sciences Corp., faced with an uncertain supply of rocket engines for its Antares rocket beyond 2016, is considering two Russian liquid-fueled engines and one U.S.-produced propulsion system as the long-term solution for the launcher, according to the company's chief executive. David Thompson, Orbital's chairman and CEO, declined to identify the engines under evaluation by the company in presentations to investment analysts and stockholders. The launcher's first stage is currently powered by two kerosene-fueled AJ26 engines supplied by Aerojet Rocketdyne but manufactured in the 1970s in Russia by the Kuznetsov Design Bureau. Aerojet Rocketdyne imported the original Russian NK-33 engines to the United States in the 1990s and modernized the engines for use on U.S. launch vehicles. The Antares second stage is a U.S.-built solid-fueled Castor 30 motor from ATK. 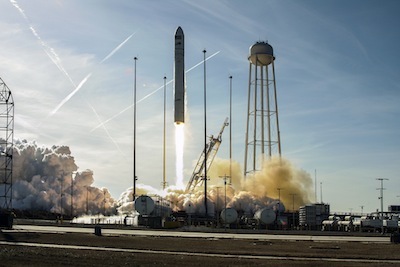 Developed in a public-private partnership between NASA and Orbital, the Antares rocket boosts commercial resupply missions to the International Space Station from a launch pad at Wallops Island, Va.
Thompson said Orbital would decide on a future engine in the next few months. "Within the next three to four months, we expect to make a final decision and enter into a contract for a block buy of main propulsion systems to cover our needs for the 2017 through 2020 period," Thompson said April 17 in a conference call with financial analysts. Seven more Antares launches are on Orbital's manifest to deliver cargo to the space station with the firm's Cygnus supply ship. Three Antares flights were completed over the last year, first with two demonstration missions and followed in January by the first operational resupply run to the complex. Orbital has purchased enough AJ26 engines from Aerojet Rocketdyne to cover its remaining cargo contract with NASA, which is worth $1.9 billion for eight operational missions, including the January flight already successfully completed. But Orbital is confident the Antares rocket will continue flying well beyond 2016. NASA plans to extend its existing cargo contracts with Orbital Sciences and SpaceX for a couple of years, and Thompson said it is likely each company will automatically receive two-to-four additional resupply missions with launches stretching into 2018. NASA keeps two cargo suppliers on contract to ensure critical supplies can reach the space station if one of the systems is unable to launch on time. With the Obama administration's decision to extend the lifetime of the space station to 2024, NASA will need even more cargo flights. "If we continue to perform well and improve our overall cost efficiency as we plan to do, I'm optimistic that Orbital will be delivering cargo at the rate of two or three missions per year for at least the next decade," Thompson said Tuesday at Orbital's annual stockholder meeting. File photo of an Antares rocket launch. Credit: Orbital Sciences Corp.
Officials have also submitted the first bid for a commercial Antares launch of a satellite, and Orbital hopes to expand the rocket's market beyond space station resupply. With the rocket's market prospects hinging on the purchase of more first stage engines, Orbital launched an engine search last year to settle on a propulsion system for the long-term. One of the propulsion proposals under consideration by Orbital is presumably to continue flying AJ26 engines on the Antares rocket. Aerojet Rocketdyne has another 23 kerosene-fueled NK-33 engines in stock -- beyond the current Antares commitment -- it says could be used for additional Antares launches to the space station or for other potential customers. The NK-33 engine was designed to produce more power for its weight than any other kerosene-fueled engine ever built. Two engines on the Antares first stage generate about 730,000 pounds of thrust to push the 133-foot-tall rocket into the sky. But the engine is no longer produced in Russia, and selecting the AJ26 for additional Antares launches might eventually require restarting the production line at Kuznetsov. The NK-33 engine is also used on a new lightweight version of Russia's Soyuz rocket. Alternative engines may be already in production or offer performance improvements over the AJ26. "Today, it is too soon to say which option will be the best one for us, although at present it appears that the newer options may be preferable to continuing with our current engines," Thompson said. Orbital has been open in its interest in the Russian-built RD-180 engine, which is manufactured by NPO Energomash and sold on the U.S. market exclusively to United Launch Alliance's Atlas 5 booster by RD AMROSS, a joint venture by Energomash and United Technologies Corp.
Orbital filed a lawsuit against ULA last year alleging anti-competitive practices, claiming ULA refused to allow the sale of RD-180 engines to Orbital. 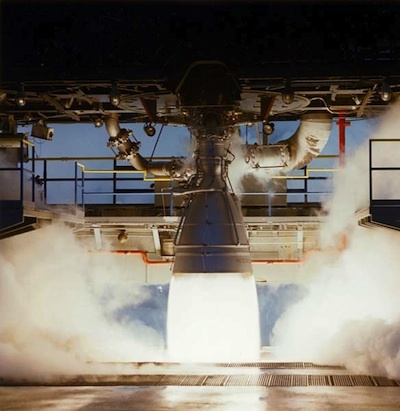 ULA had claimed it had a stake in the RD-180 engine through investments made in its development by Lockheed Martin Corp., one of ULA's corporate owners, in the 1990s. In a filing with the U.S. Securities and Exchange Commission announcing it was dropping the lawsuit, Orbital said it would seek a business resolution to its dispute with ULA. The RD-180 engine, which consumes the same propellant mixture as the AJ26, generates about 860,000 pounds of thrust at sea level. "Without getting into too much detail because of the competitive process that we're running on these different propulsion alternatives, I can say that the two new alternatives both have some good advantages in areas such as payload performance and even in [reducing] production costs compared to our original approach," Thompson said. File photo of an Antares rocket rolling to the launch pad. The first stage's two AJ26 engines are visible. Credit: Orbital Sciences Corp.
Frank Culbertson, vice president of Orbital's advanced programs group, told Spaceflight Now in January the company would stick with a kerosene and liquid oxygen-fueled engine to reduce the costs of modifying the Antares first stage tanks and plumbing. The identity of the U.S.-produced engine is more of a mystery. The only U.S.-built kerosene engine flying today is SpaceX's Merlin 1D, but it is underpowered for the Antares rocket and would have to fly in a cluster of multiple engines to produce sufficient thrust for launch. SpaceX uses this approach on the Falcon 9 rocket, which is powered by nine Merlin engines on the first stage. Aerojet Rocketdyne is the only company working on an Antares-class kerosene engine, which could generate 1 million pounds of thrust and serve as a U.S.-built substitute to the RD-180. The AJ-1E6 engine could also be used on next-generation liquid-fueled boosters for NASA's Space Launch System heavy-lift rocket. Thompson said he expects minimal research and development expenditures to be required if Orbital changes to a new Antares engine. "There is some additional product R&D that would be required over the next couple of years if we switch over to one of those new approaches, but it's fairly modest," Thompson said, adding they would fit within Orbital's already-planned R&D budget. "Certainly nothing of the magnitude of the original development costs." Officials have said Orbital's Cygnus cargo freighter cost about $300 million to design, build and test. Orbital has not put a figure on the Antares rocket's development costs, but officials said they were slightly higher than the cost for the Cygnus spacecraft. "The engineering cost or other modification cost that we would expect to incur would be bracketed from kind of zero at the low end, if we continue with our current engine, to a few tens of millions of dollars, or maybe $30 million or so at the high end, if we were to switch," Thompson said. Orbital does not plan on funding research and development of the engines themselves, Thompson said, only the cost of accommodating a new engine on the Antares first stage structure. "I'm pretty optimistic that we have a good menu of choices and that the process is going to produce a very strong, very competitive outcome for us when it runs its course here by mid-year," Thompson said. With two of the three Antares engine options built in Russia and the rocket's first stage air frame manufactured by Yuzhmash in Ukraine, Thompson said Orbital is monitoring the geopolitical situation there and how it may affect the Antares supply chain. But so far, Thompson said, Orbital has seen no impact. "We're not having any difficulty in our supplies today either from Russian-built engines or Ukrainian-produced air frames, and I don't expect to see that in the future," Thompson said. "Nevertheless, we're always assessing risks that might emerge, even if the probability of that risk materializing is low." 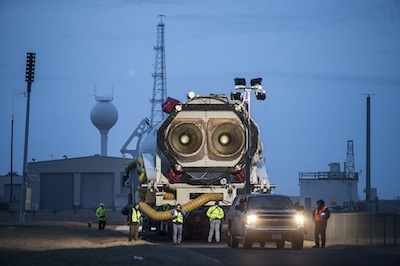 Orbital has a three-year supply of Antares main engines in the United States, and three Ukrainian first stages are stockpiled near the Antares launch site on Virginia's Eastern Shore. Thompson said two more first stages will arrive in Virginia soon, ensuring enough hardware for launches through 2015. The company's evaluation of alternative engines is aimed at "improving its performance where that makes sense and to guard against any serious deterioration in our supply availability from either Russia or Ukraine." Orbital has no interest in significantly growing the lift capacity of the Antares rocket, Thompson said, preferring to keep the launcher in the medium-lift market. "There are several operators in the United States, as well as a few other launch providers overseas, that focus on that large segment," Thompson said. "For the time being, we think it's sufficiently served by the operators that already exist. We'll focus on things up to 7 or 8 tons of cargo into low Earth orbit and leave the 10- and 20-ton class missions to others." Thompson said fully domestic engines and Antares first stages are on the menu of options being studied. "The United States, dating back to the days of the Soviet Union in the 1970s, have had our ups and downs in terms of diplomatic relations, but throughout that now 40-plus year period, space operations have continued largely unaffected," Thompson told stockholders Tuesday. "I think that's likely to be the case now as well. Orbital reported strong cash flow in its first quarter results, an indication the company's investment in the Antares and Cygnus vehicles is starting to pay off, according to Thompson. "The large investments that we made to create the Antares rocket and the Cygnus spacecraft were completed last year, and we commenced these cargo flights to the space station," Thompson said. "The combination of lower spending on research and development and [the] ramp up of production and flight activity in regards to these new medium-class products has produced already this year a very strong cash flow result."